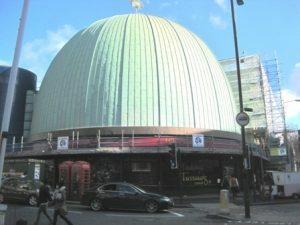 Madame Tussauds is a wax museum located on Marylebone Road just south of Regent’s Park. The museum exhibits life-size, lifelike wax models of famous people including historical personages, royalty, film stars and famous murderers. Wax modelling is an ancient tradition and both the Romans and Greeks used wax models in funeral processions. In the Middle Ages and later, offerings of wax figures were made in churches and wax masks were made in the memory of monarchs and great personages. Wax models were also important to students and practitioners of anatomy and Madame Tussaud was taught modelling by a Swiss physician whose collection she inherited. She went on to found an exhibition in Paris and subsequently make death masks of victims of the French Revolution. In 1802 Madame Tussaud brought her show of 30 models to London where it was very popular, not least because with the lack of photography in those days few people knew what the nobility and other famous personages looked like. The collection has since grown to include 300 exhibits. Madame Tussauds is open 9:30am to 5:30pm weekdays and 9:00am to 6:00pm on the weekend. Tickets can be bought on the day but it is cheaper to book online. I recommend that you book in advance (see website above) as the queues for tickets are horendous!